EMPORIUM – With the continued warm and windy spring, the fire danger continues to remain high, according to Jeanne Wambaugh, district forester with the Elk State Forest. 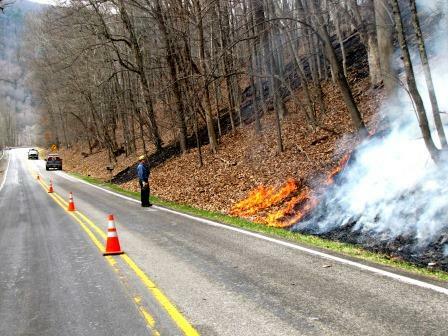 The fire, Wambaugh said, was located near Low Grade Road, state Route 555 in Gibson Township, Cameron County. She said it consumed 88 acres, threatening structures and causing two minor injuries to firefighters. Several fire companies responded: Sinnemahoning, Emporium, Austin, and Renovo, along with the Elkland and Mountaineer Search and Rescue. In addition, the Austin ambulance was on-hand to assess firefighters, as they came off the fire line and the Cameron County Emergency Management assisted with radio, communication, supplies and staffing needs. Local retailers supplied water and food to firefighters as the fire grew in size. “We would like to specifically thank Olivett’s Market for re-opening their store and donating water and ice for the growing number of firefighters,” said Wambaugh. After four air tanker drops, totaling 4,000 gallons of water and lots of difficult fire line construction, she said the fire was contained around 9 p.m. and firefighters began leaving the scene with flames still highly visible but safely within the fire lines. Early the following morning, Wambaugh said 17 Bureau of Forestry employees began the task of checking and reestablishing the fire lines. They cut trees that were still on fire to reduce the chance of the fire spreading with the advancing storm front. The gusty winds continued to made mop-up difficult, she said. The firefighters, she said, carried water on their backs in Indian Cans to put out anything smoldering near the fire line. Other firefighters, she said, raked new lines around areas where the fire jumped the fire line overnight. According to her, still others sprayed water on the fire with tanks on UTV’s and 200-gallon slip-on units on pick-ups. Firefighters even backfired to remove unburnt fuels between the fire line and the approaching fire to secure the fire line. If you would like to contact the Bureau of Forestry, please call the District Office at 814-486-3353. You can visit the bureau online at www.dcnr.state.pa.us/. Also check it out on Facebook at www.facebook.com/elkstateforest.